How Will South Africa's Land Expropriation Work? The US State Department on Thursday said it believed expropriation without compensation "would risk sending South Africa down the wrong path". 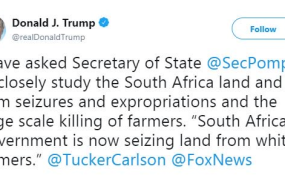 This was after United States President Donald Trump tweeted on Wednesday: "I have asked Secretary of State @SecPompeo to closely study the South Africa land and farm seizures and expropriations and the large-scale killing of farmers. 'South African Government is now seizing land from white farmers'." Department spokesperson Heather Nauert addressed a press briefing around 15:30 Eastern Standard Time, which was broadcast live to South Africans around 21:30. "I should mention that the expropriation of land without compensation, our position is that it would risk sending South Africa down the wrong path. We continue to encourage a peaceful and transparent public debate about what we consider to be a very important issue and South Africans certainly do as well," she said. "If policies are poorly implemented, there are potentially detrimental political, socio-economic and other issues." This was after a local journalist asked her if Secretary of State Mike Pompeo took Trump's tweet "seriously at all" because the journalist had not been able to find any reference to what the president had said in the department's human rights report for South Africa. "In fact, when it talks about discrimination, it says most of it is directed at blacks and the incidents of racism that it points out are all directed at blacks as well," the journalist told Nauert. Nauert said Pompeo and Trump "certainly discussed it". Later on, she said Pompeo would take a look at the issue, just as he had discussed with the president. The lack of a US ambassador to South Africa was pointed out, to which she replied that all the relevant bodies were working hard and it was not something that happened overnight. "I can tell you that our embassy has had meetings with the South African government... in the last day or so." Another journalist asked if they believed the South African policy appeared to be similar to the land grabs that had taken place in Zimbabwe. Nauert said the situations between the two countries were quite different. "It may be easy for some to try to draw a comparison but there are very big differences. In Zimbabwe, we saw the government there squash civil society, shut down the media from doing their jobs in reporting and destroy an independent judiciary and we have not seen that happen in South Africa so I think they are different situations altogether." She was also asked if Pompeo corrected some of Trump's views or explained what was actually happening in South Africa. Nauert said they never discussed the private conversations between the two "on any issue for that matter". In a statement on Thursday, ANC MP Mandla Mandela said Trump "demonstrated a total ignorance of reality". "President Donald Trump's unfortunate tweet shows disrespect for South Africa's sovereignty and our commitment to justice and redress," he said. "He would be better served by dealing with his own domestic challenges and the fundamental issues that the 'Black Lives Matter' campaign raises." Mandela said the country remained committed to finding a lasting and just solution to bring an end to land poverty, "just as we brought a peaceful end to apartheid". The Anti-Defamation League, based in New York, said on Thursday that it was extremely disturbing that Trump was echoing a longstanding and false claim. "White supremacists in the United States have made such claims for years," it said in a statement.